If you photograph the Great Pyramids from a suitable angle, you can make it appear as if they lie deep in the desert. In fact, the hillside on which they are built overlooks the concrete spread of Cairo, Africa's largest city. The Pyramids were the first stop on a week-long visit to Egypt during which I would discover that many of the country's ancient sights, whilst impressive, are dwarfed by its modern ones. Visiting the Pyramids is an unearthly experience. The stark geometry of the structures, rendered in unnatural shades of colour by the strong sunlight filtered through desert haze and my blue sunglasses, create a landscape like that of an arcade game. My task was to explore this virtual world, avoiding obstacles such as boulders and fending off the baddies (souvenir sellers and camel touts who wouldn't take no for an answer), and return to the gate - where I had arranged to meet my friend Alan and our taxi driver - before the time limit was reached. I completed the game successfully, earning bonus points for refusing to buy a single plastic sculpture or ride a single camel. I achieved this by a combination of prickliness and agility, occasionally climbing or jumping rocky precipices in order to get away from particularly persistent salesmen. This did leave me with a certain amount of time to stand back and admire this only surviving Wonder of the Ancient World, and to reflect upon the immense power wielded by the individuals who ordered the Pyramids' construction. Almost as impressive as the structures within which the pharaohs were entombed is the sheer number of expensive artefacts with which they were buried. The burial chambers within the Pyramids themselves were ransacked long before modern Egyptologists arrived on the scene, but the contents of more recently-unearthed tombs are now on display in the Egyptian Museum in the centre of Cairo. We visited on a rainy morning and found the museum a gloomy place - a monument to two centuries of institutionalised grave robbery. I wonder what the pharaohs would have thought of such plunder. The museum is a veritable warehouse of statues and sarcophagi, items that have provided historians and archaeologists with lifetimes of fascination, although to the untrained eye many of the rows of exhibits are dull and similar-looking. The dusty institution is an ancient treasure trove in urgent need of a twenty-first century revamp, and I am delighted to read that the Egyptians are planning a newer, more modern museum, due for completion in 2010. Outside the Egyptian Museum, several lanes of vehicles grind past. Much of our time in Cairo was spent sitting in the back of taxis, waiting as they idled in traffic or swerved between other vehicles in a highly unnerving manner. The hot, polluted air wafting through the cabs' windows was so tangibly poisonous that it was almost a relief when the drivers lit cigarettes and their smoke displaced the exhaust fumes. Yet although in some respects Cairo is a grim and overcrowded city, it is not without its redeeming features. The towers and domes of beautiful mosques rise above the crumbling grey buildings surrounding them, and the breezy Nile brings light and space into the metropolis. The Egyptian capital has a friendlier and safer feel to it than many impoverished mega-cities - depressing but not frightening - and the sixteen million people crushed into the city appear to live together in surprising harmony. Egyptian society runs on baksheesh - small tips given in return for services and favours. At first, I found this irritating and inconvenient. The amounts involved are small by British standards, but we were often uncertain of when to tip or how much to give, and we lived in constant fear of running out of small change. However, the constant tipping has a major benefit: Egyptians are invariably helpful and eager to please, partly because they know that their efforts may earn them a financial reward. 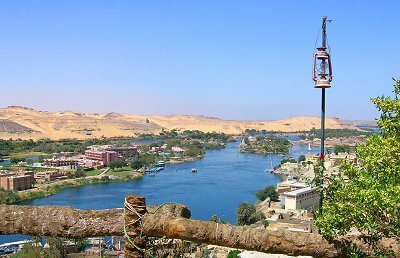 Since ancient times, the River Nile has carried Mediterranean civilisation - and sun-seeking tourists - deep into the African continent. Lacking the time or money for a Nile cruise, we opted instead to follow the river's course by rail. An overnight journey on a jerky but comfortable sleeper train took us from the rumbling melee of Cairo to the comparatively peace and quiet of Luxor, in the centre of Egypt. After a couple of days exploring the many sights of Luxor, a further train journey took us to Aswan, Egypt's sunny southern city, which lies almost (but not quite) within the boundaries of the tropics. Luxor and Aswan are like seaside resort towns, but without the sea. Instead they have the Nile, shining in the desert like a sinuous, multi-coloured lagoon. The banks of the river are splashed with greenery, behind which the yellow dunes of the Sahara rise like a false cartoon backdrop, an artist's impression of Egypt. At Luxor the Nile valley is wide and gentle, but further inland at Aswan, the great river carves more deeply into the desert, twisting and splintering its way through a sandy valley. In the middle are numerous islands, many of which are occupied by plush resorts and hotels (including one monstrosity shaped like an air traffic control tower which dominates the Aswan skyline). In these sub-tropical cities, the more well-kept roadsides are draped with purple bougainvillea and red hibiscus, familiar flowers that can be seen growing in lush locations throughout in the world. From the hibiscus, the Egyptians brew karkaday, a deliciously-fragrant crimson tea that is served, either hot or cold, in nearly every café and restaurant. Ornamental Victorian-style horse-drawn caleches clatter through the centres of Luxor and Aswan, although the presence of the horses does little to calm the traffic or to restrain the life-threatening impulses of Egyptian motorists. The captains of traditional wooden sailing boats - feluccas - congregate on the waterfront and badger tourists to take boat trips on the river. Although the persistence of the boatmen is irritating, it cannot be denied that the middle of the Nile is a beautiful place to spend a hot afternoon, with the boats resembling a flock of white birds against the sky-blue water. Dozens (if not hundreds) of large cruise boats also ply the river, travelling between Luxor and Aswan and all following the same schedule. 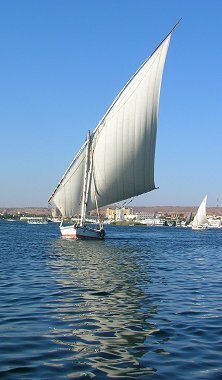 At the time we arrived, the entire fleet was in Aswan, moored two or three abreast along the riverbank in floating lines that stretched for a mile or more. Throughout Egypt, authorities and tour companies conspire to shepherd tourists together in groups, like herds of profitable cattle. This makes it easier for the Egyptians to keep an eye on their cash cows, and to guard them against acts of terrorist violence that might have unpleasant consequences not only for the tourists concerned, but also for the Egyptian economy. We tourists, it must be admitted, sometimes play the part by acting like cattle, milling about in a round-eyed way as we blunder haplessly between one money-taker and the next. Some tourists even look like cows, baring their pale, meaty legs and shoulders with a total lack of regard either for the sensitivities of Islamic culture or for the effects of the sun. The sun, glaring and merciless, is a constant feature of the Egyptian interior. It is hard to believe that three quarters of it could disappear without anyone noticing, yet the partial eclipse that passed over Luxor on 29th March, 2006, went almost entirely unobserved. There was perhaps a subtle chilling of the air, and a slight amelioration of the blinding light, but it was hard to be sure. I felt like a character from King Solomon's Mines as I passed around a pair of specially tinted solar-viewing goggles (which the Egyptians were initially suspicious of, having been warned by government health advice never to look directly at the sun) and saw the astonishment on the locals' faces at the sight of their sun reduced to a crescent. The entire staff of the waterside restaurant at which we stopped for lunch came outside to view the spectacle. The German family at the adjacent table were also thrilled by the sight ("Sonnenfinsternis! "), and began reminiscing about the eclipse that passed over Europe in 1999. Herds of tourists, unfortunately, encourage pests and parasites, and in Luxor and Aswan there are plenty. Some are outright con-artists, attempting to lure naïve visitors into a variety of complex scams. Others are legitimate street-sellers and shopkeepers who approach Westerners with offers of boat trips, taxi rides or merchandise; individually these are harmless, but collectively they are a major annoyance. I don't think that I am exaggerating when I say that I used the phrase "no, thank you" (or its Arabic translation, la shukran) a hundred times a day. Once again, avoiding the sellers and touts became a game, and we developed a few successful strategies. Occasionally there was fun to be had, such as when Alan turned the tables on an excessively persistent souvenir-seller by attempting to sell tacky pieces of papyrus back to the Egyptian. The confused seller quickly backed off. When people asked us where we had come from - which they all did, as a way of drawing us into conversation - we learned to respond with "Scotland" rather than "Britain". Some sellers had met Scottish visitors before, and recognised that we were merely a subspecies of Brit who could be harassed easily enough in English, but others paused for a few seconds while they tried to remember where Scotland was, which gave us time to make our escape. A few people commented on our 'Scottish accents', which made us smile. Alan and I grew up in southern England, and neither of us sounds the least bit Scottish. Much of our time in Luxor and Aswan was spent wandering the bazaars. There we bartered for clothes, souvenirs and spices in a series of complicated deals involving Egyptian pounds, British pounds (which some sellers disingenuously confused with Egyptian pounds when quoting their prices), Euros, dollars, and pens (which turned out to be a valued form of baksheesh). In the marketplace the bartering was fun, but elsewhere it became a nuisance. It is tiring to go through the ritual of being quoted an inflated price and trying to haggle it down every time you want to buy something, even something as simple as a taxi ride or a bottle of water. We began to see why so many tourists simply accept the excessive prices that they are first offered (especially since the differences involved are often small by Western standards), or are willing to pay commission to tour guides who can insulate them from the hassle of dealing directly with hard-bargaining merchants. At one period in its history, Egypt was ruled from Luxor, and the modern city is surrounded by ancient remains. 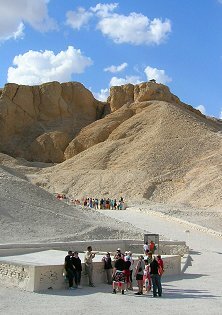 The most famous is the Valley of the Kings, from which several of the pharaohs embarked upon their journeys to the afterlife, accompanied by a wealth of supplies to help them along their way. Having concluded that crowning their tombs with giant pyramids was not the most subtle way to discourage grave robbery, these pharaohs opted to have their remains concealed in a lonely desert valley, yet even here, such a vast mass of buried treasure inevitably attracted plunderers. The famous Tutankhamun was one of the few to escape the attention of early robbers; his tomb was finally unearthed by Howard Carter in 1922. Tutankhamun's belongings now occupy an entire gallery of the Egyptian Museum in Cairo, although (after a thorough examination) the authorities did at least leave the pharaoh's mummified body at rest in the Valley. Today, the Valley of the Kings resembles a giant stone rabbit warren, with groups of tourists ambling in and out of the long burrows in which the pharaohs once resided. The tombs are architecturally simple, but beautifully painted. They feel like the corridors in a house - an old-fashioned but not an ancient house - and it is astonishing to reflect that they were constructed more than three thousand years ago. On the outskirts of Luxor itself stands Karnak, an ancient temple complex featuring columns and statues so colossal that the lines of tourists marching between them seemed like tiny computer-game lemmings. We visited in the evening to experience the sound-and-light show (such shows are a nightly spectacle at every major Egyptian monument), during which dramatic illumination adds to the temples' majesty. Unfortunately, whilst the lights were impressive, the sound component of the show was tedious, consisting largely of loud exhortations to abandoned gods. At the end of the evening we were ushered onto a high grandstand overlooking the temple and forced to endure three quarters of an hour of these booming voices, while chilly night winds blew desert grit into our faces. This was the only sound-and-light show that we attended in Egypt. Aswan also has its share of historical monuments, although its star attraction, the temple at Abu Simbel, is three hours' drive away through a desolate desert. Early European map-makers, who knew nothing of the interior of Africa, drew it as a blank space. Some areas of it really are blank. Tour buses travel to Abu Simbel in a convoy, another example of the Egyptians' tendency to herd tourists together en masse, although there is undeniably safety in numbers when travelling through such lonely regions. Our convoy departed before dawn, arriving at 7.30 a.m., yet even at this time of day the Sahara was a blazing sunbath. Abu Simbel was built by pharaoh Ramses II, and the main structure comprises four gigantic statues carved into a mountainside, marking the entrance to a richly-decorated underground temple. The temple is dedicated to the sun gods, but the four colossi outside depict Ramses himself. The structure was built as a show of power and glory, to exalt the pharaoh's greatness and intimidate his foreign neighbours. After the passing of the pharaohs, shifting sands obscured the monument, until it was rediscovered by 19th century adventurers, who shamelessly graffitied their names and dates onto the inner walls (in contrast to modern tourists, who are not permitted even to touch or photograph the temple's interior). Ramses II might be pleased to see that, 3200 years after his death, his monument is attracting foreign admirers in larger numbers than ever. It was strange to see milling crowds of pale Western tourists in such a harsh and isolated region. Abu Simbel - which lies close to the southern border of Egypt - represents the outer limit of the package-tourist universe, the edge of their flat world. Beyond it, on the far side of Lake Nasser, stretches the empty, untouristed void of northern Sudan. There are occasional boats that will ferry local people to the other end of the lake - into the fabled underworld of Deep Africa - but for air-conditioned coaches and camera-waving holidaymakers, Abu Simbel is the end of the road. Abu Simbel reminded me of a site that Alan and I visited a couple of years earlier: the Valley of the Fallen, a giant memorial and underground basilica built in the mountains near Madrid to commemorate the Spanish Civil War and glorify General Franco's regime. In contrast to the pleasure with which visitors regard sunny Abu Simbel, the Valley of the Fallen is considered by many to be a sinister place, and an embarrassment to the Spanish. The difference is entirely one of timescale. The authoritarian regime that built the Valley of the Fallen remains within living memory, whilst that of the pharaohs is remembered only by the majestic ruins left behind. Perhaps if Ramses II had been a recent dictator, instead of an ancient one, his monument would be regarded with less admiration. In its day, Abu Simbel was a remarkable piece of engineering. However, in modern times it is dwarfed by an even more spectacular human creation: the lake that the temple overlooks. At over 300 miles (550 km) long, Lake Nasser is the world's largest reservoir, and is possibly the biggest single mark that humanity has (so far) made upon our planet. Such an expanse of water shines incongruously in the middle of an otherwise desiccated desert, and its presence has profoundly altered the environment of north-eastern Africa. The reservoir holds back the floodwaters that once washed annually across the lower banks of the Nile, and supplies water for the irrigation schemes upon which Egyptian agriculture now depends. Holding back this gargantuan lake is the Aswan High Dam, an immense wedge of rock and concrete that is nearly a kilometre wide at its base and far exceeds the greatest of the pyramids in size. A substantial proportion of Egypt's electricity supply is generated by the Nile as it thunders through the giant turbines at the base of the dam. Standing on the wide boulevard that runs along the top of the Dam, it is hard to appreciate the scale of the construction. 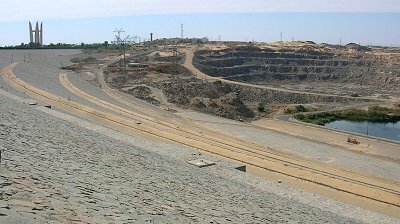 Although it is hard to imagine enemy bombs making a dent in such a massive structure, the Dam is so vital to modern Egypt that the authorities are taking no chances with its security: the area is surrounded by anti-aircraft missiles and gunners with orders to shoot on sight any plane attempting to fly over the Dam. The filling of Lake Nasser in the 1960s threatened Abu Simbel with inundation, and an international effort was made to rescue the site. At a cost of US$40 million, the temple and its colossi were cut into pieces and reconstructed, on higher ground, with agonizing care. 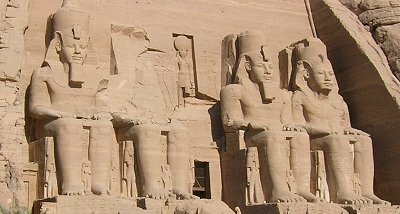 The four stone giants of Abu Simbel now sit on an unfamiliar mountainside, looking out on the barren shore of a lake a hundred times younger than the statues themselves. Ramses II's monument has outlived not only the pharaoh himself, but the very landscape in which it was constructed. Later that day, we visited Philae, a ruined temple complex that once stood on the border between Egypt and Nubia, the ancient kingdom that occupied the Nile valley to the south of Aswan. Since ancient times the Egyptians have exploited Nubia, originally as a source of slaves and mineral wealth. This exploitation reached the ultimate extreme with the construction of the Aswan High Dam, which flooded most of Nubia out of existence and turned the kingdom into a modern-day Atlantis, all in the interests of providing Egypt with a better water and electricity supply. The area's inhabitants were relocated to villages further downstream. One Nubian told us how the elders of his village, fearing that the government would build further dams, opted not to build their new village beside the Nile but instead to settle in a less hospitable location far into the desert. The temple at Philae was originally dedicated to the goddess Isis, but in later centuries it was converted into a church by Christians who attempted to scratch out the more obvious heathen artwork carved on the walls. However, most of the outlines of the Egyptian gods remain distinguishable, and the accompanying hieroglyphics, which were meaningless to the churchgoers, were left largely untouched. Like Abu Simbel, the temple at Philae had to be deconstructed and pieced together again on higher ground following the twentieth-century damming of the Nile. Philae now occupies a pretty island in the lake formed between the Aswan High Dam and an older, lower dam. Across the water from the temple, the concrete lip of the lower dam - like the rim of giant paddling pool - provides a modern backdrop to an otherwise historical scene. At the far end of Egypt lies the country's other engineering landmark, the Suez Canal. 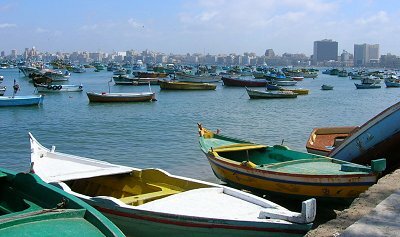 Port Said, at the Mediterranean end of the Canal, is an Egyptian version of Blackpool or Brighton, a holiday town to which the residents of Cairo come for beachside relaxation, cheap shopping (Port Said is a duty-free zone), and a chance to escape the big city. We arrived on a rainy winter day, and found the place virtually deserted. The beachside resort at which we rented a holiday apartment for the night, at an absurdly low off-season price, looked empty and forlorn. The Suez Canal was a key link in the networks of European naval power that once enmeshed the globe, and Port Said, with its spacious streets and elegant wooden facades, must once have provided a pleasant home for the merchants and administrators who lived there. The Suez Canal remains an important seaway, and watching the super-tankers pass through Port Said provides an unusual glimpse into the world of oceanic shipping, an industry that we all rely on but do not normally see or think about. However, Port Said's colonial city centre is now ghostly and faded: some of the Victorian buildings are in such an appalling state of repair that they look even older than the tombs of the pharaohs. The Aswan High Dam and the Suez Canal are central not only to Egypt's economy, but also to its recent history. In 1956, Egypt's President Nasser raised funds for the construction of the Dam by seizing ownership the Canal from its British and French shareholders, a historic act of defiance against imperialism that provoked an international crisis. To obtain further assistance with the construction of his Dam, Nasser then befriended the Soviet Union, which supported the project as part of an unsuccessful attempt to draw Egypt into the Communist fold. The Soviet contribution to the building of the Aswan High Dam is commemorated by the 'Soviet-Egyptian friendship monument', a sinister crown of spikes at one end of the Dam. Soviet-Egyptian friendship did not last long, however, and by the end of the 1970s the Egyptians were once again leaning towards the West as their allies. Egypt's modern history is a story of foreign exploitation, but it is sometimes hard to say who was the exploiter and who was being exploited. European imperialists and Cold War rivals used Egypt as a pawn in their geopolitical games, whilst the Egyptians skilfully secured vast amounts of international aid by playing off foreign powers against one another. The story is still continuing. The United States, which appreciates Egypt's efforts to maintain peace with Israel and suppress Islamic terrorism, currently pumps approximately two billion dollars' worth of aid into the country every year. The final stop on our journey round Egypt was the city founded by a much earlier imperialist, Alexander the Great, in the 4th century B.C. The bus trip to Alexandria from Port Said took us across the Nile Delta, the expanse of ponds, channels, meadows and sand dunes formed where the world's longest river reluctantly abandons itself to the Mediterranean. In this fertile triangle of land, the pressure exerted by Egypt's growing population is evident. Much of the Delta's wetland area has been scraped up into heavily-cultivated fields and ugly banks of mud upon which houses perch precariously close to the water. Following the days of Alexander and his Greek successors, expatriates from many parts of the world made Alexandria their home. However, after the Suez Crisis, foreigners were expelled from the city, and successful efforts were made to "Egyptianise" the place. With its long rows of grey concrete buildings, Alexandria Harbour reminded me strongly of the Cuban capital Havana, another seaside city that rejected Western influence back in the 1950s. Although the waterfront is drab, the harbour itself is beautiful: a vast blue semi-circle filled with a brightly-painted assortment of small wooden boats and guarded at one end by a sandcastle-coloured fort. The fort is built on the site of the Pharos, Alexandria's ancient lighthouse, which was considered a Wonder of the World prior to the building's collapse in the 14th century A.D.
Alexandria's other classical wonder was its enormous library, which once made the city the greatest seat of knowledge and learning anywhere in the world. The original library burned down over two thousand years ago, but in 2002 a grand new library was opened, with the aim of re-establishing Alexandria's place as a great scholarly city. 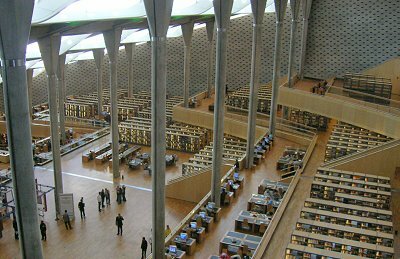 The re-created Bibliotheca Alexandrina is an impressive edifice, with an enormous auditorium-like reading room, and letters from all the world's alphabets carved on the building's outer walls. As a proportion of the world's literature, the collections on the Bibliotheca's bookshelves are undoubtedly far smaller than those in Alexandria's original library. However, the dream of gathering together all of the world's knowledge may yet be realised, thanks to a development that occurred in between the commissioning of the new library in 1987 and its opening fifteen years later: the invention of the World Wide Web. Sitting at computer terminals in the twenty-first century Bibliotheca Alexandrina, readers have access to a mass of information larger than the library's ancient founders could possibly have dreamed of, a collection comprising not thousands but billions of books and documents. Including this one. Acknowledgements � Alan Boyd, the friend from university with whom I travelled to Egypt, would rightly send me disgruntled e-mails if I didn't acknowledge his contribution to the trip. In particular, his ability to pick good-value hotels (albeit with a certain amount of help from the Rough Guide) deserves a mention, although as a curious biologist I'm partly disappointed that we missed out on the ones with the "giant orange cockroaches". Disclaimer - this is just my personal experience, it isn't a travel guide. Details of the places that we visited may change over time.